Judge Peter Spiller marked his departure from the Hamilton District Court with a nostalgic speech delivered to members of the Waikato/Bay of Plenty Branch of the Law Society. Spiller, who holds an impressive six degrees and two doctorates, left the role after being appointed chair of the Immigration and Protection Tribunal. His departure from the courts also coincides with the release of the new edition of his New Zealand Law Dictionary, published by LexisNexis. In an interview with NZ Lawyer, Spiller describes his five years as a District Court Judge with great fondness. He says it allowed him to gain new skills and procedures, learn new techniques in judgment-writing, and become “acquainted with a range of human experiences, especially in the criminal sphere”. In his farewell speech, Spiller outlined some special memories from his years as a judge. He thanked all involved, including members of the Bar, Crown Prosecutors, court staff and law graduates, for making his experience so positive. “My judicial colleagues have been unfailingly kind to me, as we have shared the ups and downs of our lives over the last years, covering illnesses, the passing of parents, the coming of grandchildren, and other human events,” he said. Career highlights also came from the people who stood before the court, says Spiller. In the civil sphere, he points to all the judicial settlement conferences that ended with success. He remembers shaking the hands of the people who had come to an agreement, and sharing their moment of relief that their “long nightmare” was hopefully coming to an end. “Other highlights in criminal cases could be the letters addressed to the court before sentencing. These letters could contain some admirable glimpses of self-awareness and acceptance of responsibility,” Spiller said. The judge is now ready to move on to his next challenge as chair of the Immigration and Protection Tribunal. While the issues and law are different, the cases are no less important to each person involved, he says. Each year there are hundreds of appeals lodged in the Tribunal for permanent residence and against deportation, and there are also a significant number of refugee appeals. “The Tribunal has finite resources and there is a continual struggle to cope with the number of appeals in a timeous and well-considered manner,” says Spiller. His own journey in the law began with a chance conversation with his uncle at his 21st birthday party, and he hasn’t looked back since. 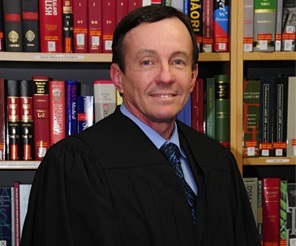 Spiller’s past positions include 28 years as a full-time law academic, more than a decade as referee of the Disputes Tribunal, and an appointment as Principal Disputes referee in 2005. He’s also the man behind the hugely popular New Zealand Law Dictionary, the eighth edition of which he’s just published after spending two years making the thousands of modifications needed to bring it up to 2014. And it’s important: In the three years since the last edition came out, New Zealand law has been amended significantly, he says. The Criminal Procedure Act 2011, for example, has fundamentally reformed and modernised the processing of criminal cases. Other legislation has also been introduced to take account of modern developments, notably technology, in a broad range of areas such as patents, telecommunications, search, seizure, and surveillance, identity information, psychoactive substances, public and government inquiries, consumer issues, and the drafting and publication of legislation. But until he needs to begin thinking about the next edition of the dictionary, Spiller will now be putting all his energy into his new role as chair of the Immigration and Protection Tribunal.